For nearly 25 years the Crane Pond Road has existed as an illegal and controversial 2-mile-long road in the Pharaoh Lake Wilderness area. This summer, there were regular reports about cars and trucks getting stuck in a mud wallow at a degraded point where the Crane Pond Road cuts through a wetland. In August, I encountered a group stuck there with their jeep when I walked the road. In September, state agencies celebrated 50 years of the National Wilderness Act. The Adirondack Park Agency (APA) had presentations about the Wilderness Act and the Department of Environmental Conservation (DEC) attended various ceremonies to pay homage to Wilderness. Both agencies elegized the importance of Wilderness. The failure to close the Crane Pond Road belies their pretty words about Wilderness. Natural resource degradation has reached a point where the Crane Pond Road is now a public safety hazard. The great value of the Forest Preserve has always been natural resource protection on a big scale across a large, intact landscape. This provides wild animals and wild nature an opportunity to exist in a mostly natural state without serious interference by people. Indeed, natural resource protection is what the Forest Preserve is all about. That the State of New York has set aside around 10% of the state in the “forever wild” Forest Preserve in the Adirondacks and Catskills is a great achievement. The Forest Preserve also provides a stunning array of outdoor recreational opportunities. These opportunities are timeless, allowing people to visit places again and again with only the most subtle of changes in a world otherwise driven by ceaseless and dramatic change. The SLMP sets out two tests for management of the Forest Preserve – natural resource protection and human use and enjoyment. Forest Preserve planning from Wilderness through Intensive Use area classifications is designed to protect natural resources while providing a broad array of public recreational options and experiences. The chief thing that separates Wilderness from less stringent classifications, such as Wild Forest, is the use of motor vehicles. Wilderness areas are supposed to be motor-free. If the “protection and preservation of the natural resources” of these lands is paramount, then the state has failed the test at the Crane Pond Road. Human use and enjoyment of these lands by automobile has degraded the natural resources that are supposed to be protected. The existence of the Crane Pond Road prevents the forest from regenerating. It allows for more intensive human use and enjoyment with motor vehicles. The Crane Pond Road provides a trail for invasive species, such as purple loosestrife, which has now infested a wetland deep into the interior of the Forest Preserve near Crane Pond. Motor vehicle use and car-camping that is popular along Crane Pond Road undermines the Wilderness character and atmosphere of this area. Crane Pond Road has a long legal history. In 1979, part of the road was initially classified as a Primitive Corridor within the Pharaoh Lake Wilderness where the road would remain usable based on maintenance and use. But a Primitive Corridor is a temporary classification that needs to facilitate management of a non-conforming use, such as access to a private land inholding, such as the Primitive Corridor roads along Lake Lila. Crane Pond Road was officially classified as part of the Pharaoh Lake Wilderness area in November 1987 as part of a classification package signed by Governor Mario Cuomo after official recommendations by the APA. In 1989, the Commissioner of the Department of Environmental Conservation (DEC) Thomas Jorling ordered the road closed. DEC used its authority under the State Highway law. 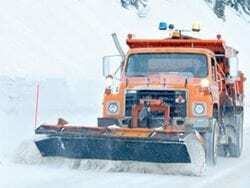 The Supervisor of the Town of Schroon, John Kelly, sued the DEC and the State Supreme Court ruled in favor of the DEC. Kelly appealed to the Appellate Division, which upheld the Supreme Court decision in favor of the DEC’s authority to close the road. The Court of Appeals, New York’s highest court, turned down a motion seeking leave to appeal the Appellate Division decision. The courts steadfastly affirmed the DEC’s legal right to close the road. The Pharaoh Lake Wilderness Area Unit Management Plan (UMP) was approved in 1992 and recounts this legal history. The UMP affirmed that this road should be closed. The state attempted to barricade the road with large boulders but these were removed. Outcries from motor vehicle access activists and local government have carried the day since then to keep the road open. A scuffle on the road saw Adirondack leaders glorified for standing up to Wilderness advocates who wanted the road closed. For more than 20 years, the Crane Pond Road has remained open and non-conforming, through five New York Governors and various administrations of the DEC and APA. Crane Pond Road runs for approximately two miles through Forest Preserve lands to Crane Pond. There are several trailheads along the road and two informal parking areas before a parking area, boat launch, and cluster of campsites and the end of the road on the west end of Crane Pond. The road runs through wetlands and along steep ridge sides. My visit in August found management to be haphazard and unlike any other part of the Forest Preserve. I did not drive the road, but parked at the end of the Town of Schroon section of Crane Pond Road, where the DEC maintains a parking area, and before the Crane Pond Road turns sharply south into the Pharaoh Lake Wilderness area. There was no trailhead register. There was not a single Forest Preserve, State Land or Wilderness Area sign all along the Crane Pond Road. If these had been put up over the years, they had been removed. Trailhead signs still remain, though often 10 feet high and one has to squint to read them. Thankfully various “No Fire” or “No Camping” signs remain because there are many undesignated roadside camping spots. I saw no Forest Ranger that day, though more than a dozen cars were encountered along the road. There were cars parked at the main parking area outside the Wilderness area. Perhaps these were people who knew that the Crane Pond Road is an illegal road in the Wilderness area and chose not to drive on the road. Or, these were people who found the road in disrepair and did not want to risk damage to their vehicle. Or, perhaps, these were people who just wanted to hike. Click here for more pictures of the Crane Pond Road. At the end of the Crane Pond Road where it’s a Town of Schroon Road, just before the parking area and Wilderness boundary, there’s a large 10-foot American flag suspended above the road. I took this to be a statement about the “rights” of motor vehicle advocates to use the Crane Pond Road and symbolic of what this road has come to represent. The Crane Pond Road has been maintained over the years. There are fresh water bars in places along the road. Downed trees have been cut and cleared. Fill has been deposited in places. The DEC state’s that it has not done any work on this road and said it does not know who maintains the road. A Freedom of Information Request to the Town of Schroon about road maintenance activities has not been answered. Information about whether Rangers patrol on foot or in a truck was not provided by the DEC. The DEC has clear legal authority to close this road, but has elected not to do so for political reasons. The failure to effectively manage the closure of this road has resulted in serious natural resource damage to the Forest Preserve. 50 years after the National Wilderness Act, wilderness remains so controversial that our state agencies that manage Wilderness in the Adirondack Park cannot enforce Wilderness laws, regulations or policies. The APA and DEC are exploring options for revision of the State Land Master Plan. Crane Pond Road reveals weaknesses in enforcement of the SLMP. Violation of the law has not moved these agencies to act. Public safety has not moved these agencies to act. Natural resource degradation has not moved these agencies to act. This week I received letters from the APA and DEC stating that they have opened a Forest Preserve Violations Report on the Crane Pond Road based on a letter we submitted. I look forward to their investigation and response. The road condition is abyssmal. For a while, the “stones of shame” could be found outside the black bear restaurant…warrensburg or north creek?. I remember taking off my NYSDEC hat before entering the restaurant…. DEC doesn’t have the resources or clout to fight this one at their current staffing. The land manager that covers Pharoah also has Dix, Giant, and High Peaks Wilderness. Besides it is the section before Alder brook is the best maintained trail we have thanks to the vehicle users. I’m curious. What’s the distance from where the Crane Pond Road, that is maintained by the town, ends to the pond itself? Can a person perform a canoe carry from Pyramid Lake to Crane Pond? It will be interesting to see what the investigation outcome is and what the proposed action will be. I believe I am correct that DEC Forest Rangers patrol on foot from the wilderness boundary. I also agree that the State had the legal right to close this road and that the judge’s decision allowing the road to be closed was legally correct. That said, I firmly believe that the road should have been left as a primitive corridor for as long as the Town of Schroon wanted to maintain it. By now I imagine they would have ceased maintenance of the far end as I have to believe it would be very costly to fill that mud hole. That would likely have resulted in the road ending at the Goose Pond trailhead – a compromise that the DEC offered to the Town of Schroon at the time of the court case. Unfortunately, by that time the debate had become so acrimonious that compromise wasn’t possible. While many environmentalists hate the words “political” and “compromise”, one must remember that it is elected political bodies that ultimately decide on funding for managing our public lands, and it is an elected governor who ultimately approves all UMPs. Thus all decisions regarding the Forest Preserve are indeed “political” and sometimes there has to be “compromise”. We as citizens have the right to express our opinions to our elected officials and even to form groups to increase the force by which we express those opinions. However, we must be prepared to occasionally give in when it appears the goal isn’t worth the fight. The damage done by illegally operated ATVs at many locations is a serious problem, and worth fighting against that illegal use. By contrast, I feel the Crane Pond dispute was truly a “teapot tempest” the outcome of which has now emboldened motor vehicle advocates everywhere – symbolized by the large American flag hanging over the approach road. The same effect came from the fight over the Old Mt Road. Personally I am glad to see these things figured out but some people will not like the outcome no matter which way it goes. The money spent in court will far out weigh the costs to put in a culvert and fix a mud hole. No one in their right mind would want to drive or WALK across that. I’m perpetually amazed that law enforcement allows blatant violation of state law this way. Is it possible to report these violators to the State Police since the DEC is refusing to enforce the law? Sure. But I am not sure that the folks that are just driving down there are blatantly violating any laws. There is no gate? There is no signage? How would anyone know? If they wanted to enforce the law they would and could. It is just a blatant cave to a small number of law breakers who insist they are somehow fighting for “liberty” and “rights,” but in reality just want to drive in the woods so they can bring coolers full of beer to Crane Pond. This is not an unfair characterization–just visit there on a summer weekend and take a look. Sure, there are arguments to be made for leaving the road open, but those arguments should be made in a legal manner–not by trampling the law. It isn’t a “compromise.” It is a disregard for the laws of the State, and that is not patriotic. I agree there is nothing “patriotic” about it. But like I said they are not breaking any laws since the road has not been closed by the state. Like Peter says above the state has not gone through the procedure to close the road. He claims it is for political reasons. Maybe that is true. Wrong – this road was closed legally. Period. That closure has not been enforced. Though it may be a migrating factor in sentencing in this case, ignorance of the law is not an excuse for failure to obey the law. So the original order in 1989 (upheld by the court) was all that was required. It is now just an enforcement issue. I get it. Thanks. The fact that the DEC is maintaing and using the road might be another mitigating factor. I have used this “road” for many years to access Crane Pond, really a lake. My sole interest was to cross Crane Pond and then carry my Raddison (or in recent years my Hornbeck) into the surrounding hills and back on the same day to fish various trout ponds, some of the most productive in The Park. I am barely able to do so any longer due to my aging knees, but for those that follow me perhaps a compromise to allow parking at the Goose Pond trailhead would make sense. Lets consider people of all ages and abilities when we look to limit access further. Walking to these ponds and back in one day (eg.,Burge or Horseshoe) with a canoe would be nearly impossible from either the Schroon Road or Putnam Pond for even the most able. Doing so from the Goose Pond trailhead would still be a challenge for most without overnight camping. Do we want to encourage more camping on these ponds’ shores? In a democracy ruled by law, “politics” and “compromise” should take place during the creation of laws, regulations, and policies. Not during their enforcement. And what exactly an American flag has to do with any of this is beyond me. Symbolizing someone’s freedom to damage wetlands if they want? The right to ignore and defy democratic institutions? Since the DEC did not restore the barrier after it was removed and has placed no signs prohibiting vehicular traffic, there cannot currently be any enforcement. This is the result of purchasing more land than we can properly manage. I found this article long winded to make a simple point. That said, I take exception to the author characterizing the American flag as a symbol of defiance. It is a symbol of our nation. If it was indeed placed as a symbol of defiance than that was an incorrect use, but the author does not need to further compound this error by making it an issue in the article. That is a fairly serious load (loads?) of fill that has been placed there since Peter’s picture. Maintain it, keep it open! Peter you say that the DEC has clear legal authority to close the road but they have not. So the road is still open. Why would they find any “violations” regarding the road if they failed to act to close the road? If the road is open driving down it is not illegal right? >> Who could have placed this flag over the road? If I were to wager on this one I would bet it is someone who often says ‘I am proud to be an American.’ Someone who walks around dressed up as though he is a participant in some sporting event; someone who has an ‘I love Ted Nugent’ bumper sticker on his car. I’ll bet it’s the same person, or a relative of, who goes into the Moose River Plains and shoots holes in the rooftops and/or sides of those brand new outhouses that the DEC has spent so much time and effort constructing. dave says: And what exactly an American flag has to do with any of this is beyond me. >> An American flag is one way of saying I’m proud to be an idiot. Paul says: This is the result of purchasing more land than we can properly manage. 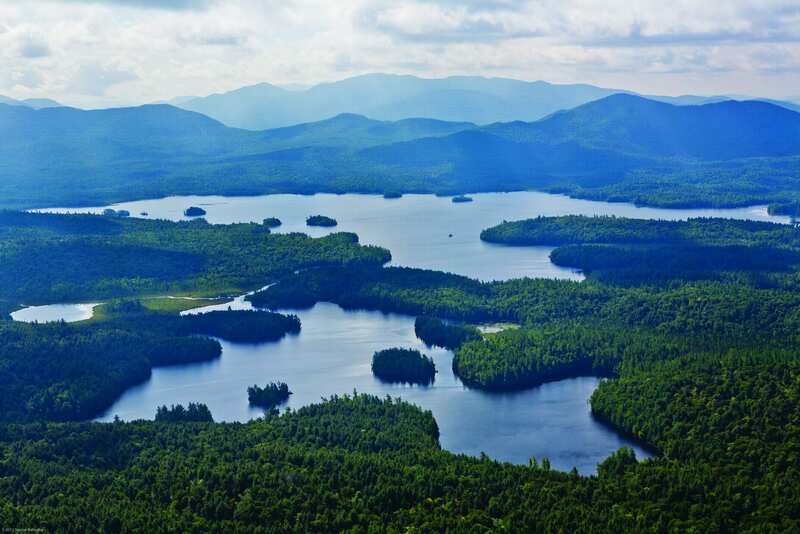 >> In other words no more land is worth protecting in the Adirondacks. No, if you are going to buy the land then spend what is necessary to protect it. If you are not willing to do that then you have too much and it will go unprotected like this. Doug says: I take exception to the author characterizing the American flag as a symbol of defiance. It is a symbol of our nation. >> And nothing to be proud about I might add. The DEC DOES NOT patrol on foot. They drive on this road at will and I have personally encountered them many times, including one spring a few years back when one of their SUVS got stuck in snow and ice and a second one arrived with come-alongs to pull the first one out. We had the sense to walk due to icy conditions. This road is maintained by someone and I’m surprised the mud hole hasn’t been repaired yet. I think there is a lot of sensationalism in this article. With the care the road has received over the years–trust me it’s a highway compared to Pharaoh Lake Road–the environmental impact is hardly to the degree suggested by this author. The tone of the piece suggests it was his first time here. I agree with Tony that a compromise is the best environmental groups are going to get. Also, access has not been denied and it is a huge stretch to use the word illegal. The road is used by dec rangers. I have seen them drive all the way to crane pond. Close the road and let the area return to what it should look like. The area is highly over used by the wrong crowds. Crowds that are more suited to be at the local bars. Name-calling and negative personal characterizations are not constructive in any debate, as they only inflame. DEC informs me that the Pharoah Lake Road to Mill Brook will be closed at the Wilderness boundary. That road is in bad shape also but has not received the attention and therefore the unfortunate hot-headedness that the Crane Pond Road has. The Goose Pond compromise that Tony references is reasonable. I was told off the record last night by someone in Ray Brook who did not want to be identified for obvious reasons, that DEC Operations filled the road (hence the very large amount of fill used). I was told that it was done without the permission of the DEC Region 5 Director. I stand corrected on my statement that the DEC patrols on foot. I should not have generalized from a few instances when I know that they did patrol on foot. So let me get this straight. Apparently some here feel it is not illegal to drive on a legally closed road once someone has illegally removed the signs and barriers? This is not a case of ignorance of the law, but a blatant thumbing their noses at the law. Try the same tactic in any city or town in the state with a one-way street you don’t like and see what happens. The idea too that DEC lacks manpower is true, but apparently they have decided it is more important to have very obvious and frequent patrols of hikers at the ADK Loj parking lot in order to prevent what crime? Meanwhile, the DEC drives on the road that is supposed to be closed. 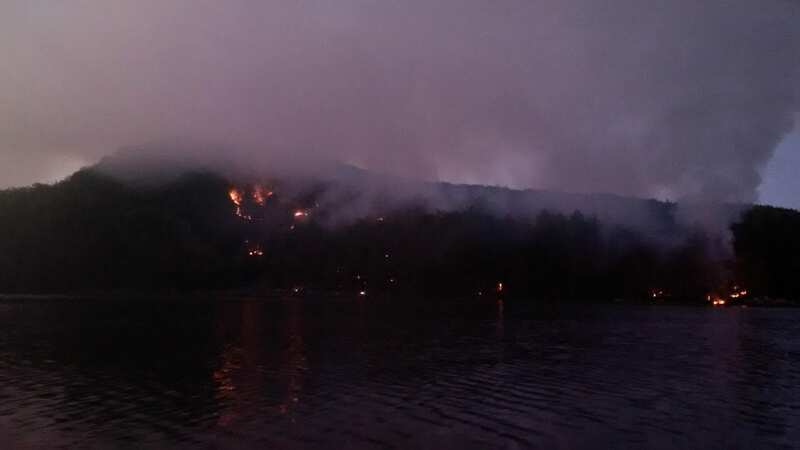 I believe the crime that DEC is trying to prevent at the ADK Loj could be characterized as crime against nature. seeing as how hundreds if not thousands of potential perpetrators enter the woods at this location every day. Diverting patrols from the Loj to the Crane Pond Road may help the Crane Pond area, but it will hurt the High Peaks area. As all the comments attest – the Crane Pond Road is a mess from both natural resource protection and Forest Preserve management standpoints. The recent gravel fill thickens the plot. Was this undertaken by the DEC? The Town of Schroon? A private individual? What authorization was provided? What was the policy review took place? Was there public disclosure? Is this a wetland fill? What kind of motor vehicles or motorized equipment was used in a Wilderness area? Was this done under some kind of emergency powers to protect public safety? I’ve camped on Crane Pond every year for the last 39 years. I’m not going to let anybody stop me from driving back to the lake. I’m too old to carry a canoe & gear any distance. How many acres are in the Adirondacks? Crane Pond is one of the few places you can drive to the lake and enjoy the serenity without having to deal with a reservation. I have a great disdain for the DEC running the Adirondacks like a hotel. That’ll be the day I make a reservation to enjoy public land. At the base of Crane Pond as you start up the trail towards Pharaoh Mt. you can see remnants of the foundation for the old Hospital. I go to Crane Pond for the same reasons the sick and elderly went in the early 1800s. Its a special place that I’m prepared to fight for. No law, no road block and nobody will stop me. To my last breath I spit at thee. The legal question of wether this is some type of prescriptive easement (ROW) is an interesting one. If the owner (the state) has not opposed its use, and appears to possibly be encouraging its use (road fill? ), then it could stand as a legal ROW. It probably would on private land but here on state land it is an open question. As usual Bauer and his gang of terrorists do not know what they are talking (lying?)about. The Crane Pond Road is a Town Road, Town of Schroon. No state agency, department, or court can change that. Only the town can. It is low maintenance because there are no homes on it, so attention to other roads takes priority. Crane Pond is the for-runner of Schroon. It was an active settlement when the iron ore mines were working. Some families still have ancestors there. The road remains open so people can drive there to fish the pond or to travers to other ponds in the area. Also it is open in case of emergency or fire. Bauer and his terrorists are just looking for chance to start a lawsuit on they can steal more money from the state to support their environment and natural resources destruction policies. Look at all the food, shelter, etc. the state has destroyed, no wildlife, just to appease these terrorists groups. Back in 2011, Tropical Storm Irene destroyed Marcy Dam in the High Peaks, which had been built during the Great Depression. The pond formed by that dam was a beautiful sight, the reward for the initial hike in from Adirondack Loj. The State of New York decided it would be too much trouble to rebuild it, and thus it has been left a depressing mud flat. Even if somebody provided the funds to rebuild it, they would still be denied permission since it represents “returning to the natural habitat”. The desire to close Crane Pond Road arises from the same stupidity as the policy of leaving Marcy Dam destroyed. They both served a useful purpose, making the beauty of the Adirondacks more accessible to human beings. Nearly every spot in the Adirondack Park is within 3 miles of a road and nearly every large lake you can drive right into – how much more accessible would you like it? I have been camping in Crane Pond since I was a child in the late 50’s. Years of having this road open hasn’t proven the authors point. The surrounding ponds and mountains are just as beautiful as I remember them as a child. Besides, I don’t own two homes in the Adirondacks as the author indicates he does. The only piece of heaven I have is camping and fishing at Crane Pond once a year. There actually is as trail register as of November 2015 but you need to head down trail, at least toward pharaoh summit.